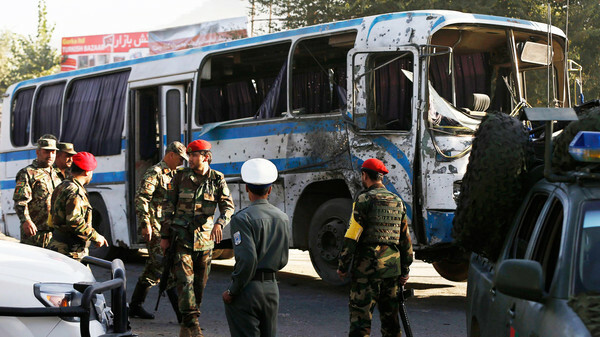 JNN 02 Oct 2014 Kabul : Two Taliban suicide bombers hit army buses in Kabul on Wednesday with initial reports of six people killed in the twin attack, police said, one day after the new Afghan government signed a deal for U.S. troops to stay in the country. “There have been two suicide attacks targeting buses carrying Afghan national army personnel,” Farid Afzali, chief of the city’s police investigation department, told AFP. The Taliban claimed at least 20 soldiers were killed, but the insurgents regularly exaggerate death tolls after attacks. “This is a clear message to the stooge government that signed the slave pact, and we will step up our attacks after this,” Taliban spokesman Zabihullah Mujahid told AFP. Afghanistan and the United States on Tuesday signed the long-delayed bilateral security agreement to allow about 10,000 U.S. troops to stay in the country next year. The signing took place on newly-inaugurated President Ashraf Ghani’s first day in office and represented a major step towards mending frayed ties with Washington. Hamid Karzai, who stood down as president on Monday, had refused to sign the deal — a disagreement that symbolized the decline in Afghan-U.S. relations over recent years. U.S.-led NATO combat operations in Afghanistan will finish at the end of this year, and the Taliban have launched a series of recent offensives that have severely tested Afghan soldiers and police. NATO’s follow-up mission, which will take over on January 1, will be made up of 9,800 U.S. troops and about 3,000 soldiers from Germany, Italy and other member nations. The new mission — named Resolute Support — will focus on supporting Afghan forces as they take on the Taliban, in parallel with U.S. counter-terrorism operations. President Barack Obama welcomed the deal, saying it was an historic day. But the Actual Facts , show an exactly different Directions of the US and Western their allies , in collaboration with the Saudi and Persian Gulf states . And Now the Over stay of US Troops on the Afghan land , clearly signals that , they want to Prolong their stay Just to give more shelter to the shattered Taliban and their Off shoot organization of TTP , the leaders of which have been long sheltered by the US sponsored Afghan Govt. As now this is a Proven fact that Taliban are the Illegitimate children of Saudi and US Nexus , as they both have their evil desires of destabilizing this region , and to Keep their Hegemony , As Saudi Monarchy wants to Keep the Leadership of the Muslim and the Arab World, while US wants to keep its influence and Power in this Strategically Most important Region of the World , as if they are out of this region, then they are no More a Super Power , in the Presence of China , Russia and Iran Ready to Break the Barriers of their success and Economic Growth , which will result in total Kick out of any interference of any Country or Power in this Region , Making it Once again the Real Golden Bird of the World . This entry was posted in Asia Pacific, Jafria and tagged Afghan Army, Afghan National Army, Afghan soldiers, afghanistan, Buses, taliban, the Taliban, Twin Suicide blasts. Bookmark the permalink.